Most of my clearest memories of Grampy begin about ten years ago when I started having weekly Friday lunches with him and Grandmama (now "GG") at their home in Valley Forge. At that time, my workplace was only a couple of miles from their house and so it was a quick trip over and back during my lunch hour. During lunch Grampy actually never really said all that much; it was always GG and I doing most of the talking. But this was something I came to respect about Grampy: he chose his words carefully. He only spoke when he had something to say; the world would be a better place if more of us followed his example. Grampy liked to have his lunch at noon. Exactly noon. Early on, I would arrive at their house around 12:15 and sometimes Grampy would be sitting in his chair at the table - ready to eat. GG would immediately take the hot lunch (always a hot lunch) out of the oven and we'd sit down to eat right away. Over the years my arrival for Friday lunch got later and later (today we usually eat at 1:30!) and I am grateful to Grampy for his willingness to wait for me. Four and a half years ago, Owen started joining us at Friday lunches. Owen made Grampy smile more. And especially in his final years at the Wayne Center, as Parkinson's disease slowly robbed my grandfather of his ability to move his body and speak his mind, Grampy seemed to love seeing his Great Grandson. Grampy would reach out to Owen, beckoning him to come closer. He would laugh at Owen's silly antics - often the only sounds Grampy made during our visits. What a privilege it was for little O to be able to get to know his Great Grandfather. And I too consider it a privilege to have had such a great man as my Grandfather. Husband to my Grandmama for 64 years - he was an example to me of enduring love and faithfulness. Member of the Gideons International, often spending Saturdays on college campuses giving Bibles to college students - he was an example to me of genuine Christianity, and a strong link in the Legacy of Faith into which our son Owen was blessed to be born. Oh that we may follow in your beautiful footsteps, Grampy. Kenneth Lloyd Morse, 88, of Berwyn, an electrician and community volunteer, died of complications from a neurological disease Tuesday at Wayne Center. 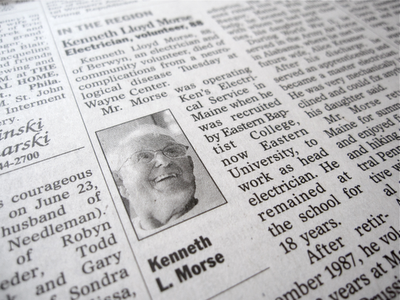 Mr. Morse was operating Ken's Electrical Service in Maine when he was recruited by Eastern Baptist College, now Eastern University, to work as head electrician. He remained at the school for 18 years. After retiring in December 1987, he volunteered for 13 years at Manor Care in King of Prussia. He visited residents and assisted with the guinea pigs, rabbits, and dogs that were used in the pet-therapy program, his daughter Bettie Ann Brigham said. Mr. Morse was born in Windsor, Maine. Unable to care for him, his brother, and their three sisters, his parents offered the children for adoption. His adoptive parents raised him on a farm in Bangor, Maine. With their help, he located his siblings with whom he had kept close ties, his daughter said. During World War II, he served in the Army Air Force in Alabama, where he met his future wife, Alice Kreamer. After his discharge, he served an apprenticeship and became a master electrician. He was very mechanically inclined and could fix anything, his daughter said. Mr. Morse returned to Maine for summer vacations and enjoyed fishing, hunting, and hiking there and in Central Pennsylvania. He was active with Gideon International and the King of Prussia AARP. In addition to his wife of 64 years and daughter, Mr. Morse is survived by a daughter, Jean McIntire; a son, Gordon; two sisters; a brother; four grandchildren; and three great-grandchildren. A memorial service will take place at 2 p.m. Saturday at Upper Merion Baptist Church, 585 General Steuben Rd., King of Prussia. Mr. Morse donated his body to science. Obit in the Philadelphia Inquirer on June 25, 2010.